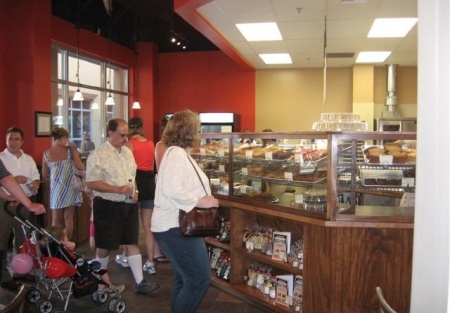 This turn-key retail and specialty events bakery business recently opened in summer 2007, and was turning a profit of ~$4,000/month on sales of ~$16,000/month as recently as December 2007. Due to personal circumstances, the current owners must unfortunately sell this exceptional facility as soon as possible. As a result, they are currently accepting any and all bids. The owners placed great pride and hard work into creating a warm and inviting family environment with the smell of "fresh" home-baked goods. Every item is made from scratch with the finest ingredients to ensure freshness and taste of the highest quality. There are more than $125,000 in new equipment under warranty and improvements, including 5 various large stainless steel Beverage Air refrigerators/deli case, a Saturn 500 Double Oven, a Le San Marco Espresso Machine, 2 Globe mixers, and much more. The retail store serves a high-traffic multi-use suburban strip mall that faces a major highway and garners nearby traffic from two new prominent restaurants and a deli. The mall also hosts free concerts and events throughout the year right outside your front door! Furthermore, the store has partnered with Tully's coffee and has an inviting living room that can appeal to those northwest cafe' aficionados. Approximately 1/3 of sales are earned from wedding cakes and providing desserts and other baked goods to several local grocers, restaurants, and coffee shops. If you are looking to start-up or expand your bakery business, this may be the perfect opportunity for you. Take the next step and complete the online confidentiality agreement and you?ll be provided with the restaurant name and address. Also you will given priority notification to new listings in the future, prior to the general public, giving you the best chance to ?scoop in? the best opportunities. There are also more photos available to our registered buyers. This is not a Paramount Restaurant Broker, Inc. Listing and Paramount Restaurant Brokers, Inc. assumes no liability for this ad or its content. Larry Braden is the listing broker and is licensed in Washington State. Turn-Key Bakery with New Equipment & Retail Storefront. Monthly Profits of ~$4,000 on Sales of ~$16,000. Sales Expected to Grow Throughout Holidays. Very Warm and Inviting Retail Storefront. Provide desserts and other baked goods to several local grocers, restaurants, and coffee shops. Special Events and Wedding Cakes. Huge Opportunity to Cut Labor Costs with Owner/Operator. Located in High-Traffic Strip Mall. Free Concerts and Events Promoted by Landlord Right Outside Your Doors. Two Prominent Restaurants and Deli Recently Opened in Nearby Courtyard.